Congratulations. By reading this blog, you are taking an important first step in furthering your tech career ambitions. Whether you’re looking for a role in computer engineering, computer science, robotics, or the biomedical field; there are a few things you will need to know to maximize your future potential and make sure you not only earn you what you are worth but also have the most personally rewarding career possible. Regardless of your goals within the tech field, there are a ton of ways to be well-compensated while having a great experience. Along with other innovations in the industry, jobs are changing rapidly, and this means that you should keep a few things in mind to maximize your success. Here are five steps to reach—and exceed—your tech career expectations. Most of us have heard the expression, “It’s not what you know, it’s who you know.” This is as true in the tech industry as it is in any other field. While it’s easy to be heads-down and focused on studying or work, don’t forget to foster a strong personal and professional network. Old friends and new friends can later become valuable contacts. People you meet along the way through events and both official and unofficial networking outlets can provide valuable insights and connections to help further your career in unexpected ways. And if you’re the shy type, see our guide for how to network if you don’t like networking. To improve your networking prospects, consider getting active in online and IRL tech communities. Work on side projects when time permits. Give advice to others and be willing to receive it in return. Even in the crazy world of tech, networking is still king when it comes to building and fostering lasting relationships that drive future success. There are a number of networking resources for all types of tech professionals—including ones who serve women and minorities in the industry. Here are a few from Tech Republic, but you can also find more here. Let’s get this out of the way: you probably don’t know as much as you think you do. Treat this not as a sign of weakness, but as a learning opportunity. Identify any skill or knowledge gaps you may have and then treat filling them almost like a second job. Keep notes as you find them and what you uncover as you build your knowledge. In a field as dynamic as computer science or technology, you’re almost always going to be bumping into things you may not completely understand or be entirely familiar with—especially in the early days of your career. Use your annual performance reviews or other benchmarking occasions with your boss to be on the lookout for ways to improve your skills and learn new competencies. If your goal is to achieve a leadership position in your company and you’re starting to feel stagnant, it may be time for a change of scene. While some may balk at the idea of being a dreaded “job-hopper,” it’s pretty standard these days. A recent CareerBuilder survey indicated that 45% of new hires expect to stay with their current company for less than two years and that nearly one-third of managers expect their employees to job-hop. According to an article by Forbes, some of the benefits to job-hopping are an opportunity to build diverse skills, work in different geographic locations, identify the best workplace cultural fit for your personality. The negative stigma from years past seems to be on it’s way out. A recent LinkedIn survey indicated that 59% of people who have changed jobs did so because they saw more career growth in their new role — proving that for many, changing jobs is not just about the immediate satisfaction of a bigger paycheck; it’s also about fostering future opportunities. This one especially applies to women and minorities in the tech world. Tech is still overwhelmingly white and male with the most commonly represented minority being Asian men. For example, Apple is a company that prioritizes female representation, and according to Paysa data, only 16% of employees there are women. 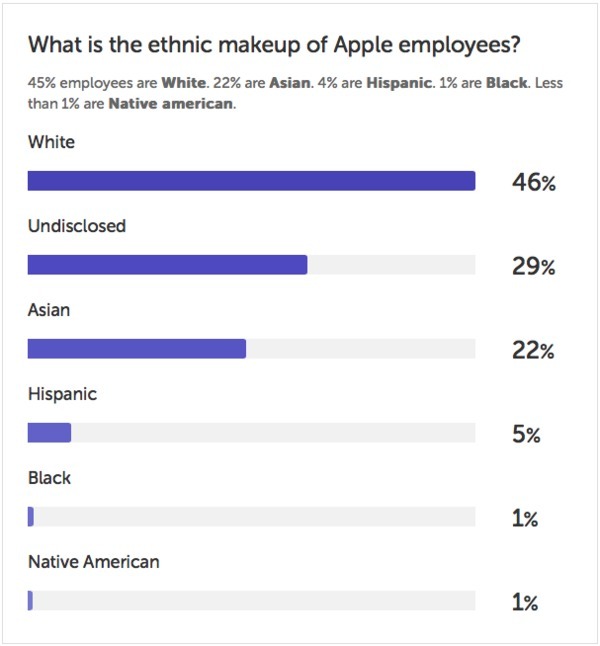 Moreover, while people of Asian descent represent 22% of Apple’s employee population, over 46% are Caucasian. 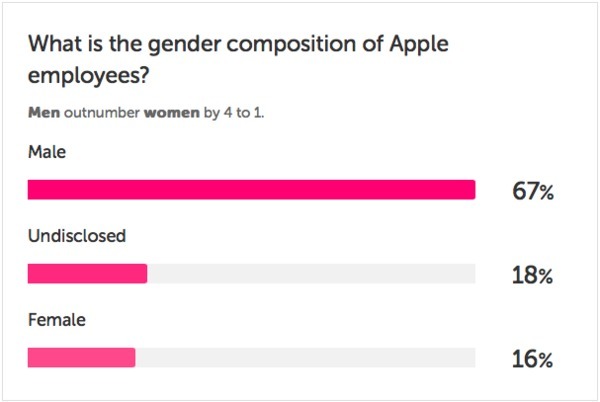 Gender composition of Apple employees, per Paysa data. Ethnic composition of Apple employees, per Paysa data. Ask Questions: It’s okay not to know everything. Being inquisitive will help you identify and fill the skills gaps we discussed before. Be Curious: Foster a real sense of wonder and your culture of continuous learning. Not only will it make you indispensable at work, mastering new skills can give a much-needed confidence boost. Find Supportive Allies: Work to create your network of like-minded people you can rely on. Whether it’s people from the same background as you or just those who think you can relate, this can be an excellent way to build professional confidence and build morale. Be Straightforward About What You Want: If you don’t ask, you don’t get. Speak up and communicate openly with leadership about your career goals and what you hope to contribute to the company. Hope to be head of IT eventually? Let your boss know and seek out mentorship along the way. Emotional IQ and technical prowess are often seen as unlikely bedfellows. However, empathy is one of the most underestimated “soft” skills that can put you ahead of your peers for career success. We all know the old trope of the sarcastic IT guy who alienates his colleagues and makes them feel stupid. Don’t be that person. By focusing on communication skills, initiative, and driving the end-user or client experience; you will help build a better workplace and a more successful business outcome, making you an asset to your organization and those around you. Nobody is perfect. Go into your work expecting to receive lukewarm or even negative feedback from time-to-time. While it can sometimes sting, learning to handle criticism graciously and proactively will earn you the respect of your peers and leaders—especially if you follow it up with positive action. Tech is all about problem-solving, and if your problem is something that’s in your control, you’ll stand out as someone who has the skills to make it far in the field and drive the organization forward. On the flipside, as your career progresses you will increasingly be in a position of providing feedback to your peers, subordinates, and sometimes even your leaders. Obey the Golden Rule by treating them respectfully and relaying this information in a way that is both helpful and respectful. Critique the work, not the person. By following the advice we’ve laid out above, you can increase your likelihood of having not just a financially rewarding career in tech, but also one that is personally enriching. If you’d like to learn more about how to further your ambitions, Paysa is also here as a resource to help you navigate your career map and get paid what you’re worth. Get started today by creating your personalized profile and check out our aggregated data based on tens of millions of potential career paths in tech. Our goal is to increase 1 million tech workers’ salaries by $5K per year. Paysa will provide personalized recommendations based on your needs and help you with pursuing new skills, salary negotiation, and find career advancement opportunities. Get started today and put the power of paysa.com in your hands. How nice, you cherry picked data by avoiding the major IT companies like Tata, Cognysis, etc. H1Bs, for instance, are overwhelmingly Indian. In fact, those IT companies are being sued right now because their workforce is 90%+ Indian men. No mention of them in your list of companies, of course, even though they have MORE employees than Google and Apple. How interesting. I guess discrimination doesn’t count if it is done by other groups.